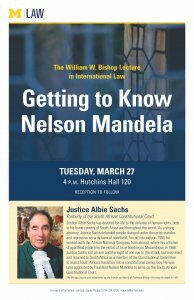 Please join us for the 2018 William W. Bishop Lecture in International Law: Getting to Know Nelson Mandela, to be presented by Justice Albie Sachs, formerly of the South African Constitutional Court. 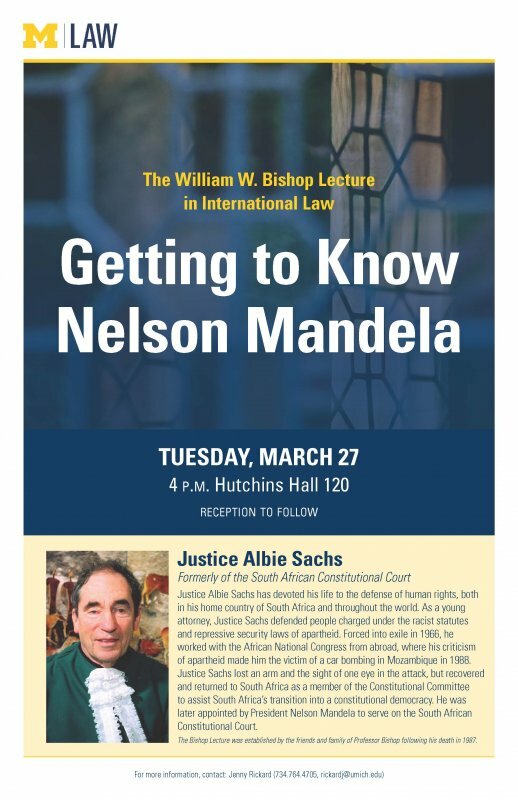 Justice Albie Sachs has devoted his life to the defense of human rights, both in his home country of South Africa and throughout the world. As a young attorney, Justice Sachs defended people charged under the racist statutes and repressive security laws of apartheid. Forced into exile in 1966, he worked with the African National Congress from abroad, where his criticism of apartheid made him the victim of a car bombing in Mozambique in 1988. Justice Sachs lost an arm and the sight of one eye in the attack, but recovered and returned to South Africa as a member of the Constitutional Committee to assist South Africa’s transition into a constitutional democracy. He was later appointed by President Nelson Mandela to serve on the South African Constitutional Court. The Bishop Lecture was established by the friends and family of Professor Bishop following his death in 1987.